1. Take Route 128 South to the Weston/Waltham Exit / Route 20 WESTBOUND exit. Follow Rte 20 WEST for approximately 6 miles until you come to the lights at the intersection with Route 27/ Route 126 (Wayland Center). Turn LEFT onto Route 27/Route 126 SOUTH. Follow Route 27 approximately 1 mile – at the second traffic light (corner of West Plain Street and Route 27), take a RIGHT onto West Plain Street. The first LEFT (after the baseball field) is PEMBERTON ROAD. Turn Left on to Pemberton Rd and we are approx. 10 houses up on the right hand side. 2. Take Route 128 South to the Weston/Wayland Exit 24/ Route 30 WESTBOUND exit. Follow Rte 30 WEST for approximately 6 miles until you come to the lights at the intersection with Route 27. (You will go through six sets of lights after coming off Rte 128. (#1 after coming off Rte 128 to Rte 30, #2 about ¼ miles, #3 a short 50 yards up the street, #4 at the intersection of Wellesley St., #5 Oak St. (L) and Rice Rd ® and #6 at route 27). Stay on Rte 30, go through the lights and take the 2nd RIGHT onto Pemberton Rd, (1st right is Stanton St., 2nd right is Pemberton Rd.). 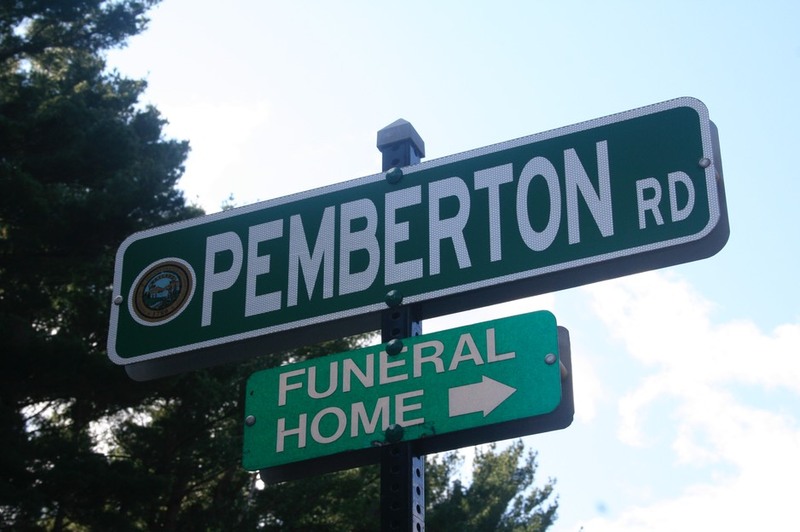 There is a “FUNERAL HOME” sign on the street sign. Funeral Home is about 300 yards on the left. Rte 27. (You will go through six sets of lights after coming off Rte 128. (#1 after coming off Rte 128 to Rte 30, #2 about ¼ miles, #3 a short 50 yards up the street, #4 at the intersection of Wellesley St., #5 Oak St. (L) and Rice Rd ® and #6 at Rte 27). Stay on Rte 30, go through the lights and take the 2nd RIGHT onto Pemberton Rd, (1st right is Stanton St., 2nd right is Pemberton Rd.). There is a “FUNERAL HOME” sign on the street sign. Funeral Home is about 300 yards on the left. Mass Pike (Route 90) EAST to Exit 13 (Natick, ROUTE 30). After tollbooth bear left to Route 30 East. Go straight through set of light at Speen Street, staying on Rte 30. Go over Mass Pike and Lake Cochituate and take 2nd left after Lakeview Cemetery (1st left is Griffin Circle, 2nd left is Pemberton Rd). There is a “FUNERAL HOME” sign on the street sign. Funeral Home is about 300 yards on the left. Route 9 to Route 126 NORTH to Route 30 EAST - travel approximately 2 miles on Rte 30 EAST crossing over the Mass Pike) to Pemberton Rd on LEFT.